You’d think that a terrible, power-mad boss in the workplace would drag everyone’s spirits down. But a recent study published in the Journal of Business Ethics suggests that at least one type of person might actually thrive under an abusive manager: psychopaths. Researchers recruited job-having volunteers and asked how they would react to hypothetical bosses portrayed as either constructive or abusive. In a separate study, they asked volunteers to rate their own bosses and how they felt about them. 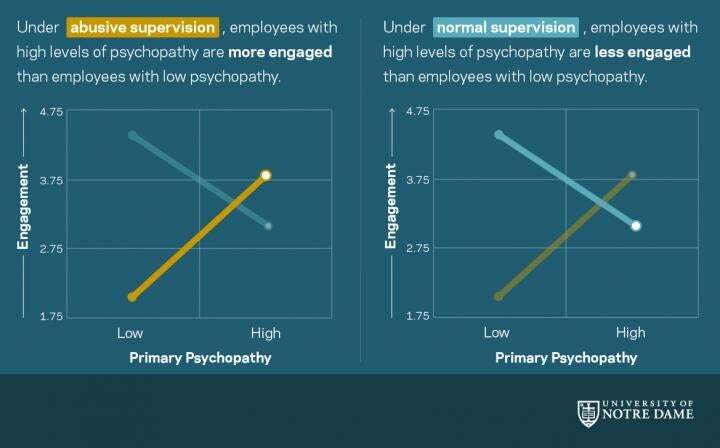 In both surveys, the more than 400 volunteers also took a test that measured their level of psychopathy. Psychopathy’s most consistent feature is a high level of antisocial behaviour, but those classified as primary psychopaths are thought to be more unfeeling and less fearful, while secondary psychopaths are more prone to anger and impulsive behaviour (estimates vary, but around one to two per cent of the general population might have clinically noticeable symptoms of psychopathy). In the first experiment, people who scored higher on the measure of primary psychopathy were more likely to give a hypothetical abusive boss the thumbs-up. In particular, they imagined they would be happier working for them, while non-psychopaths said the opposite. In the second experiment, people higher in primary psychopathy reported that they enjoyed working for their real-life abusive bosses. This preference for abusive bosses, Hurst says, lends credence to two common theories. One is that psychopaths are better suited for high-stress, demanding environments like leadership positions—a sort of psychopathic advantage (the companies they’re in charge of, however, may not flourish long-term). More negatively, it suggests that a bad workplace is often sustained through a vicious cycle.